It has been just over a month since Michael White and Peter Thompson at Ocean Independence took over the CA for the sale of the 40m ketch Clan VI with Pacifica Yachting, and now comes news of a €650,000 price cut as delivery of the owner's new yacht is imminent. Not only was Clan VI the first yacht to be built by Perini Navi in 1983, she also signalled the introduction of their semi-automated sail handling system which made it possible to sail a large sailing yacht with only a single person on deck, the first of its kind. Accommodation is for 12 guests in five staterooms including a full beam master suite. Twin 407hp Deutz engines give her a cruising speed of 10.5 knots. She is in excellent condition following refits in 2004 and 2008. 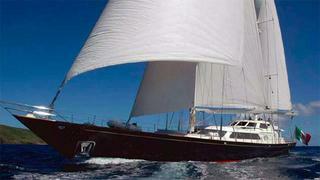 Lying in Viareggio, her asking price is now €3,850,000, VAT paid, down from €4.5 million.